AMC‘s mega-hit TV series, The Walking Dead, is in its sixth season, which can be a precarious time for any TV show. Creator Robert Kirkman is well aware that often, series are looking to end of their own accord, or end up cancelled, around this point in their lifecycle. 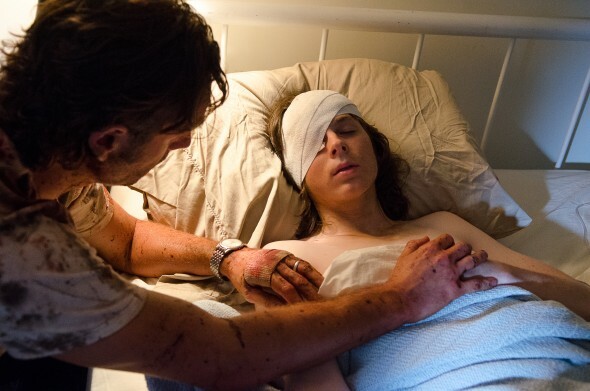 This was a huge episode: three major deaths plus Carl losing his eye — a lot of big moments from the comics. Where does the show go after this? Kirkman: Everyone on this show is aware this is the sixth season. A lot of shows in their sixth seasons are either completely winding down or they’re struggling to find some kind of narrative transition to make the show about something else that can keep going. There are a lot of shows that lose steam at this point. Everyone involved is aware of the fact that these are dangerous waters and times when people can completely lose interest in a show. We’re working harder than we’ve ever worked, pulling out all the stops and rolling our sleeves up to make this as exciting and as explosive as we possibly can. Comic readers know this is a huge time period. There’s a lot of big moments from the book that are getting adapted from the “No Way Out” storyline in the midseason finale and midseason premiere and a big pivotal moment in the series and there’s a lot more to come. We’re putting it all out on the table for this season and we know there’s a lot more to come if we pull this off. It sounds like there is still life in the old girl, yet. What do you think? Can (and should) The Walking Dead TV show continue for many more seasons, or should the creative team start to plan to end the series? Let us know, below. The Walking Dead: Will There Be a Season Seven Cliffhanger? Very much liked ep-9 & AM very much looking forward to the rest of season-6 peace. Yes Episode 9 was very good, but out of 9 episodes so far in Season 6 only 2 have really been worth watching ( 2 and 9). 7 to go, meaning all the remaining episodes need to be good or very good to overtake previous average or not so average episodes. I’m in my 60’s and I love THE WALKING DEAD! I could watch it for many more years. I’m sure we’ll eventually lose characters we love, but that’s life. My favorite is Carol and I’d hate to lose her! Yes, by all means, keep this show going. It never occurred to me that The Walking Dead would not continue…it MUST continue…on & on & on….I am certain all that watch this show agree! KEEP IT GOING !!!!! Pam, you said this so well – I agree completely! Don’t know whether TWD will go beyond that maybe ended after eight seasons.